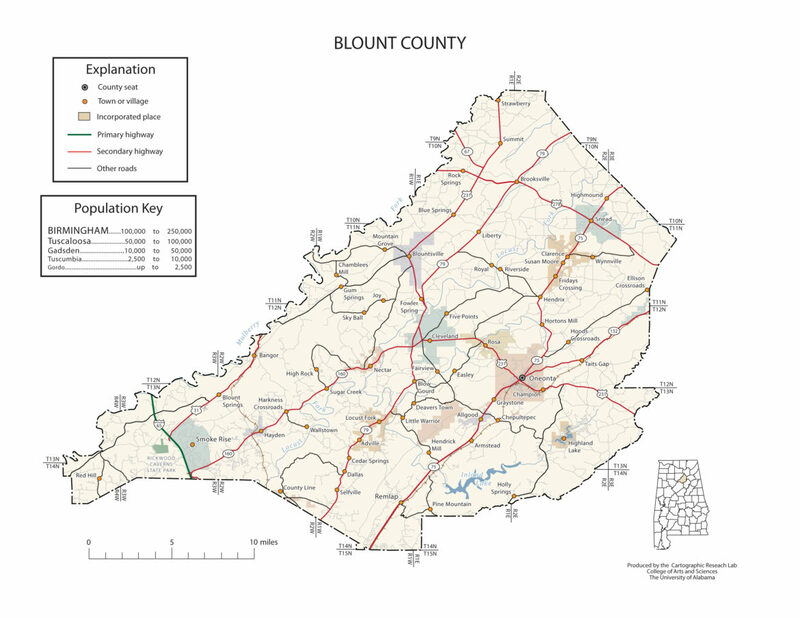 Blount County population is 57,322. Its county seat is Oneonta. Blount County was created by the Alabama Territorial Legislature on February 6, 1818, formed from land ceded to the federal government by the Creek Nation on August 9, 1814. This county lies in the northeastern quadrant of the state, which is sometimes known as the mineral region of Alabama. This county was formed in 1818, and named in honor of Governor Wm. G. Blount, of Tennessee. It is noted for the abundance of its minerals, the diversity of its soils, the variety of its productions, and mineral waters. In its progress, it is keeping pace with the surrounding counties, and is ranked among the best in the State. Its area is 700 square miles. Population in 1870, 9,945; population in 1880, 15,369. White, 14.210; colored, 1,159. Tilled Land: 68,860 acres. Area planted in cotton, 12,502 acres; in corn, 29,161 acres; in oats, 4,551 acres; in wheat, 10,087 acres; in tobacco, 48 acres; in sweet potatoes, 371 acres. Cotton Production ; 4,442 bales. The face of the country in Blount is rather peculiar. It is penetrated through the center by a plateau which occupies a belt from eight to ten miles in width. On one side of this mountain plateau, running parallel with it, is Murphree’s Valley, while on the opposite side is Browns Valley. Along this belt of plateau are found excellent farming lands, which have been wonderfully assisted during the last few years by the moderate use of fertilizers. Cotton grows most readily upon this broad upland, especially if a little assisted with fertilization. Because of the greater ease of cultivation, the farmers of the county have come, in many instances, to prefer these elevated soils to those of the valleys for cotton-producing purposes. As pasture landsthese can not be excelled in the county. There is a combination of elements here that favor the raising of stock, among which may be mentioned, an adequate supply of water, and soils favorable to the growth of clovers and grasses. Perhaps a better section than this plateau can not be found in Alabama for the production of fruits. As fine apples and peaches grow here as are produced in the South. Indeed, Blount has the reputation of being the best apple growing county on the continent. The character of the climate is such as to favor a certain crop almost annually. It is very rare, that the fruit crop is cut off by frosts. The valley lands are intrinsically more ferlile than those which lie along the broad plateau. The soils of both the valleys are, in some instances, as rich as those which belong to the famous Tennessee Valley. Even along these valleys, there are flinty ridges which break the evenness of the lands, but between these exist the most productive soils. The most of the cotton raised in Blount is grown upon the loamy valleys. In addition to corn and cotton, the county produces oats, wheat, tobacco, sweet potatoes, rye, and sorghum. It has for several years producd a great deal of wool, and as stockraising increases, there is no doubt that this product will correspondingly increase. The main streams of Blount are Mulberry, Locust, and Blackburn Forks, and Big Spring creek. The principal timbers are beech, walnut, poplar, sycamore, post and Spanish oaks, hickory, wild cherry, pine, and black gum. The county took the premium at the Atlanta Exposition for the largest and finest specimens of wild cherry. Vast districts of the county are overspread with forests of timber. Transportation is afforded through the medium of the great Louisville and Nashville railroad, which traverses it from the north to the south. Another railroad is in contemplation and is expected soon to be built from Birmingham to Guntersville on the Tennessee river. This road will penetrate the heart of the famous Murphree’s Valley, and along its route, from one terminal point to the other, will prevail vast deposits, both of coal and iron. The road will prove of incalculable advantage to the population residing in the region through which it will pass. Such is the attractiveness of this region that it will serve speedily to allure a population as soon as itsresources of mine and soil are known. Excellent school and church facilities exist in almost every portion of the county. Blountsville, the seat of justice, Bangor, Summit, Hanccville, and Garden City, are places of importance. The industries of the county are varied. Extensive limeworks are seen at Blount Springs. Limestone, dug from the quarries here, is daily shipped in large quantities to Birmingham, where the manufacturers hold it in repute above any other available limestone. It prevails in inexhaustible stores, in hills about Blount Springs. Coal and iron are abundant in the county. Petroleum is also found. Enjoying, as it does, facilities for transportation to the markets of the South, North, and all points in the far Northwest, nothing prevents Blount from taking rank with the foremost counties of the State. Blount Springs, situated immediately upon the Louisville and Nashville railroad, is the favorite watering place of Alabama. These famous Springs are 130 miles north of Montgomery, and are embosomed in the most picturesque mountain scenery. The waters are especially adapted to the cure of scrofula, rheumatism, dyspepsia, and all affections of the bladder and urinary organs. Here, as in the adjoining counties which lie along the railroad, the value of the lands diminishes as they recede from the line of communication. Land can be purchased in the county at prices ranging from $5 to $35 per acre. There are 34,320 acres of government land in Blount county. Oneonta, Alabama is the county seat of Blount County. Oneonta is home to the Covered Bridge Festival. During World War II, a small POW camp was operated outside of Oneonta. It is situated in Murphree Valley between Red Mountain and Sand Mountain to the northwest and Straight Mountain to the southeast. U.S. Route 231 passes through the center of the city, leading northwest 7 miles to Cleveland, Alabama, and southeast 14 miles to Interstate 59 in Ashville. According to the U.S. Census Bureau, the city has a total area of 15.3 square miles, of which 15.2 square miles is land and 0.077 square miles, or 0.54%, is water. Warrior is the northernmost city in Jefferson County, with outlying parts of the city in Blount County. It is traversed by I-65 and U.S. Highway 31. According to the U.S. Census Bureau, the city has a total area of 9.8 square miles, all land. Warrior is in the Central time zone. The elevation at the center of town is 564 feet (172 m), though it ranges from over 620 feet (190 m) north of the center to less than 300 feet (91 m) along the Locust Fork of the Black Warrior River, which forms the southern boundary of the city. Allgood, formerly known as Chepultepec, is a town in Blount County. At the 2010 census the population was 622. The town’s name comes from a family of homesteaders from South Carolina who settled in the area in the early 19th century. Altoona had its start in the year 1900 as a mining town, and was named for another coal town, Altoona, Pennsylvania. A post office has been in operation at Altoona since 1900. It incorporated in 1908. What became Blountsville appears on an 1819 map as the mixed Creek/Cherokee Native American village of “Wassausey” (meaning Bear Meat Cabin, the name of an Indian translator who lived there). The town was established by Caleb Fryley and Johnny Jones in 1816 as Bear Meat Cabin. The post office was opened as Blountsville on October 20, 1825, and incorporated on December 13, 1827. It was the county seat until 1889 when the government was moved to Oneonta. A major crossroads in early Alabama, Blountsville became a Confederate depot for the cavalry. Confederate forces led by General Nathan Bedford Forrest and Union forces led by General Abel Streight skirmished briefly in the town on May 1, 1863. Cleveland is located in central Blount County.The Locust Fork of the Black Warrior River flows past the northwest side of the town. U.S. Route 231 intersects Alabama State Route 79 north of the center of town. Route 231 leads southeast 7 miles to Oneonta, the county seat, and north 56 miles to Huntsville. Route 79 leads northeast 31 miles to Guntersville and southwest 37 miles to Birmingham. Hayden, Alabama is centrally located between Huntsville and Birmingham with easy access to I-65. Whether you are looking for an area to build your business or raise your family, the Town of Hayden is exactly the area you have been searching for. With an industrial park located within minutes of I-65 Hayden is a great place to locate your business with a lower tax rate than our neighboring counties and municipalities. We are far enough away from the big cities to raise your family in a hometown environment yet close enough so that you can still enjoy shopping and dining without sacrificing that small town life. The community of Highland Lake grew up around an artificial lake originally named Shuff Lake after Hugh Shuff, the engineer who created it in 1954. Shuff oversaw construction of an earthen dam across the Blackburn Fork of the Little Warrior River, resulting in a 257-acre lake that was to be used for irrigation and recreation. The area now incorporating the town of Nectar was a settlement that had existed before Alabama became a state in 1819. During the Creek War of 1813-14, Andrew Jackson and his troops reportedly camped in the vicinity. This area was originally known as Tidmore for Henry Tidmore, the first postmaster in the area in 1902. It is unknown when or why the town’s name was changed to Nectar. Rosa is located in central Blount County. Its town limits extend southeast to border the city of Oneonta, the county seat. U.S. Route 231 passes through the center of Rosa, leading southeast 4 miles to the center of Oneonta and 18 miles to Interstate 59 near Ashville. US-231 leads west 3 miles to Cleveland and then north 60 miles to Huntsville. The Snead area was settled as early as 1839, when the federal government deeded land to John Jackson. In 1853, physician G. W. White purchased land and built a water-powered flour and grist mill next to the falls on the Warrior River. In 1874, White built a store in the community. The first post office opened in 1882, and the town was named Snead after its first postmaster, John Snead. For most of its existence the town of Susan Moore was known by the name Clarence. The area was settled first by the Robert M. Moore family around 1865, and the family continued to play a prominent role in the town for many years. In 1923, two grandsons of Robert Moore, both doctors, donated funds for a new high school, which they named in honor of their mother, Susan Moore. The town gradually came to be referred to as Susan Moore. In November 1982, the town was incorporated, and in December an election was held to determine the new mayor and town council. One of the council’s initial actions was to officially rename the town Susan Moore. Smoke Rise lies east of Interstate 65 in western Blount County, with most homes sitting atop Bryant Mountain or in the valley below. The community began in the late 1960s as a large planned residential subdivision. Residents founded the Smoke Rise Homeowners Association in the mid-1990s, but the community remains unincorporated despite occasional discussion of an incorporation vote. Bangor, also known as Coopers Gap, Copperas Gap, or Coppers Gap, is an unincorporated community in Blount County. Nearby Bangor Cave housed a speakeasy during Prohibition and continues to be a popular attraction for area spelunkers.The community lies east of Interstate 65 and approximately 30 miles north of Birmingham. Bangor is located near the former resort community of Blount Springs. In 1937, the landowner of Bangor Cave, J. Breck Musgrove, convinced investors to provide funds for the construction of a nightclub in the cave. The cave soon included a bar, electric lighting, a bandstand, and a lounge for women. A locked room contained slot machines, roulette wheels and card tables. A spur track of the Louisville & Nashville Railroad could drop visitors off at the entrance to the cave. The caveowners faced legal battles with Alabama governor Bibb Graves, and the Bangor Cafe Club was permanently closed in January 1939. Bright Star, also spelled Brightstar, is an unincorporated community in Blount County. A post office was established as Brightstar in 1889, and remained in operation until it was discontinued in 1907. Bright Star has been noted for its unusual place name. Brooksville is an unincorporated community in Blount County, located at the junction of U.S. Route 278, Alabama State Route 74, and Alabama State Route 79, 8.7 miles northeast of Blountsville. In 1999 Brooksville attempted to incorporate itself. Proponents of the move stated that the laws of the community would be based on the King James Bible and the Ten Commandments. Hopewell is an unincorporated community in Jefferson County. Today it lies mostly within the corporate limits of the City of Bessemer. The historic Sadler Cemetery lies nearby which contain the graves of many pioneer settlers of western Jefferson County. Little Warrior is an unincorporated community in Blount County. A post office called Little Warrior was established in 1852, and remained in operation until it was discontinued in 1905. Little Warrior has been noted for its unusual place name. Mount High, also known as High Mount, High Mound, or Highmound, is an unincorporated community in Blount County, located approximately two miles west of Interstate 65 and Smoke Rise, and approximately 25 miles north of Birmingham. Mount High also is just southwest of Rickwood Caverns State Park. Remlap is an unincorporated community in Blount County, located along Alabama State Route 75, 11.7 miles southwest of Oneonta. Remlap is named for the area’s Palmer family; the community’s name is “Palmer” spelled backwards. Sky Ball, also spelled Skyball, is an unincorporated community in Blount County. Sky Ball has been noted for its unusual place name. Straight Mountain, also spelled Streight Mountain, is an unincorporated community in Blount County. Straight Mountain has been noted for its unusual place name.